And that is what I am thinking, when thinking about my first day of school. It is August and many German kids start school these days. My niece is one of them. Last thursday she had her bag ready and her cornet filled with candy. Her parents, grandparents, aunts, and uncles were invited to spend the day with her. We escorted her to school, attended the welcome ceremony, waited for her, while she was sitting in her classroom for the very first time. When all this was over, we celebrated with presents, a nice lunch, coffee and of course cake 🙂 And I was the one honored to make it. You know me and can imagine that I would not make a plain cake, covered with some sprinkles. It had to be something special.. something to remember. On the Saturday before, I started to make the decorations. After sketching a few designs, I decided for a two tier cake with crayons surrounding the bottom layer and a sitting figure on top of the upper layer. The figurine should resemble my niece and her accessories should very much look like the originals. Her favorite color is blue (at the moment), so I made her a blue dress, decorated with little flowers. 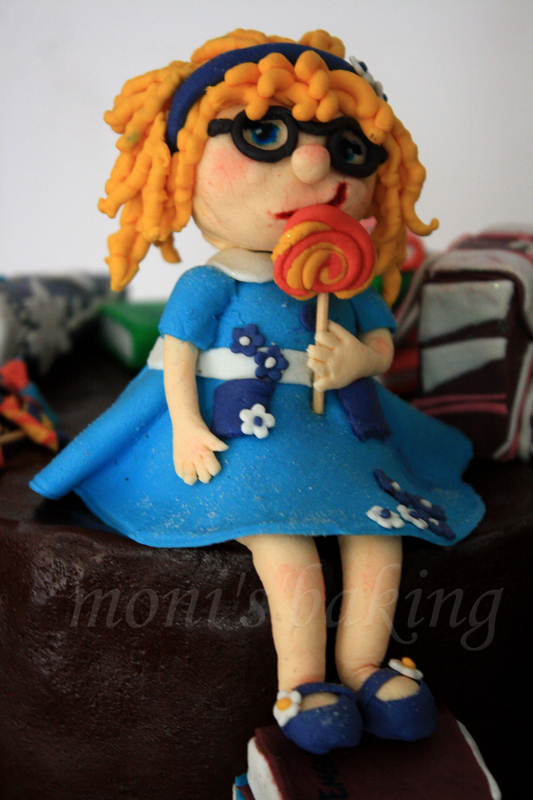 I wanted to make her sit next to her cornet and eat the candy, so I made a lollipop and molded a full cheek on one side, with a smile going to the same side. From a photo I copied her satchel and cornet and tried to come as close to the originals as I could. I made some little candy out of gum paste and let everything dry for a couple of days. 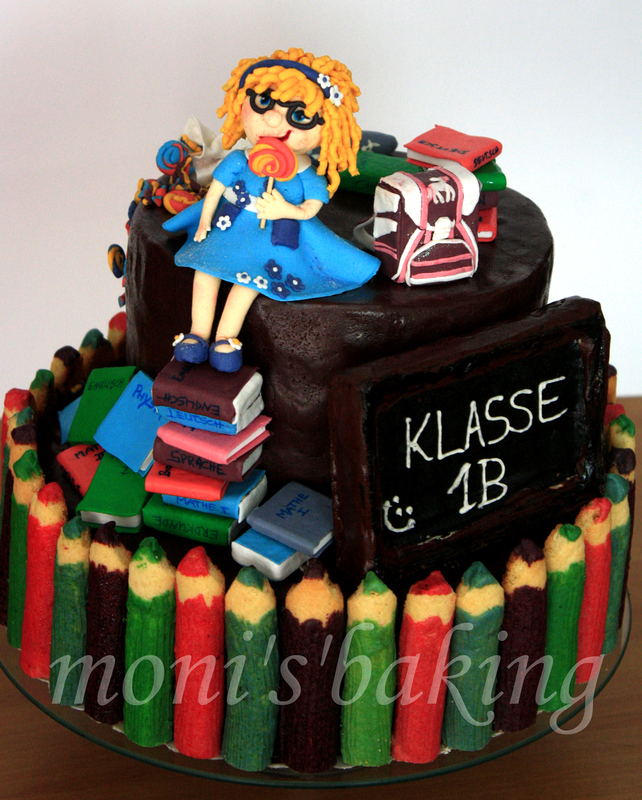 In order to support her feet, while she was sitting on the upper cake, I made school books. 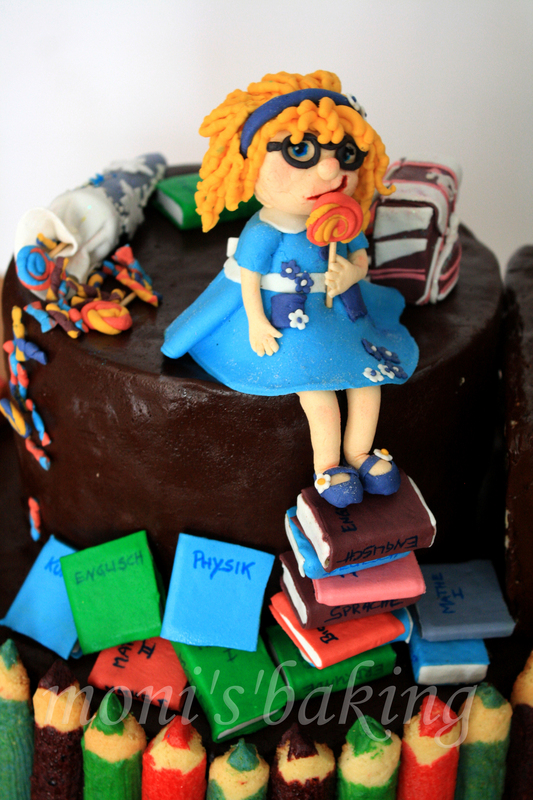 I covered wafers and sugar tablets with colored fondant and labeled them with the names of school subjects. I made a whole bunch of them, so I could scatter them a little on the cake. For the crayons I made long rolls out of cookie dough and when they were still warm I cut and formed them into crayons. After cooling I covered them with white chocolate, which I dyed in different colors (the colors are not very bright when you use white chocolate and normal food color. There are special food colors for chocolate, which I don’t have, so if you want to have bright colors, you might need to consider getting those). I also used the same cookie dough for the blackboard. 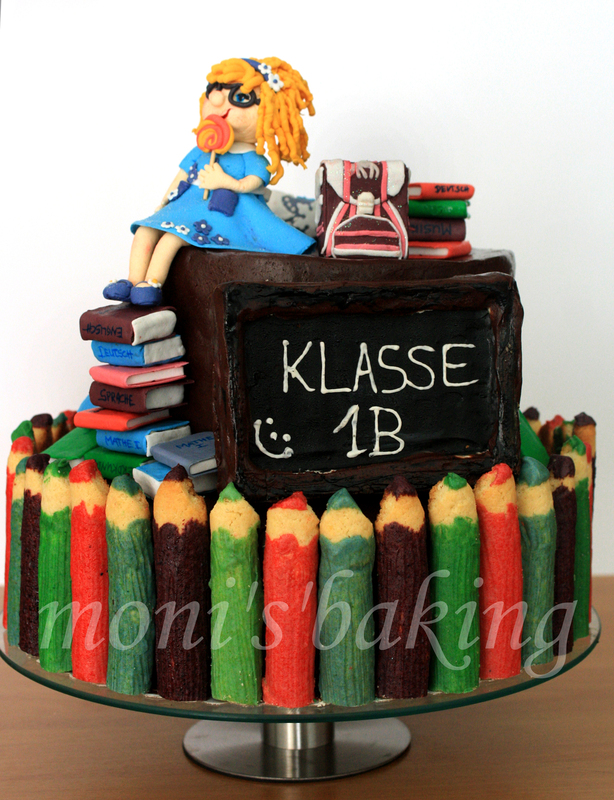 I wanted to have the blackboard on two stands, so I could put it on top or at least behind the upper cake, but the stands broke when I was trying to attach it to the cake, so I left it without. I only used a rectangular piece of cookie and scraped out the middle, which I filled with melted dark chocolate (I added some black food coloring, to make it real dark). The frame I covered with chocolate fondant. 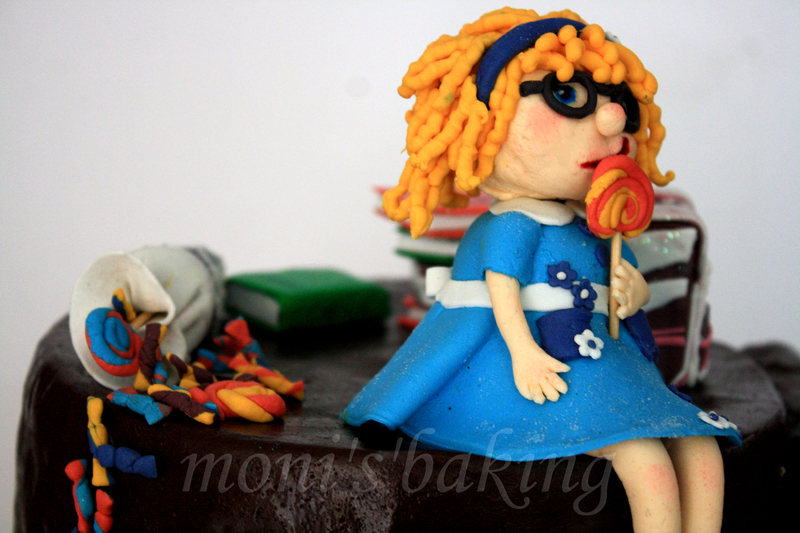 When all the decorations were ready, I started to prepare the cakes and the fondant. I decided for a marzipan-apricot cake as the bottom layer and a chocolate egg liqueur cake with blackberry-lemon filling on top. The marzipan-apricot cake is a lot of work, because you need to bake each layer separately, but it is good for hot days, not having any creams or anything that would go bad or melt quickly. This time I also wanted to try the chocolate fondant for two reasons – number one: because I wanted to try it. I heard good and bad things about it and wanted to see for myself. The taste is supposed to be very good (it is! ), but the handling is supposed to be difficult.. (hmm.. I am not sure about this one). The production was a little trickier than the normal, white fondant, but I didn’t have a hard time to knead it and it was soft and chewy. It did melt (maybe because it was so hot) very easily and was not so smooth on the cake. So I was very happy with the handling, but not so much with the look. 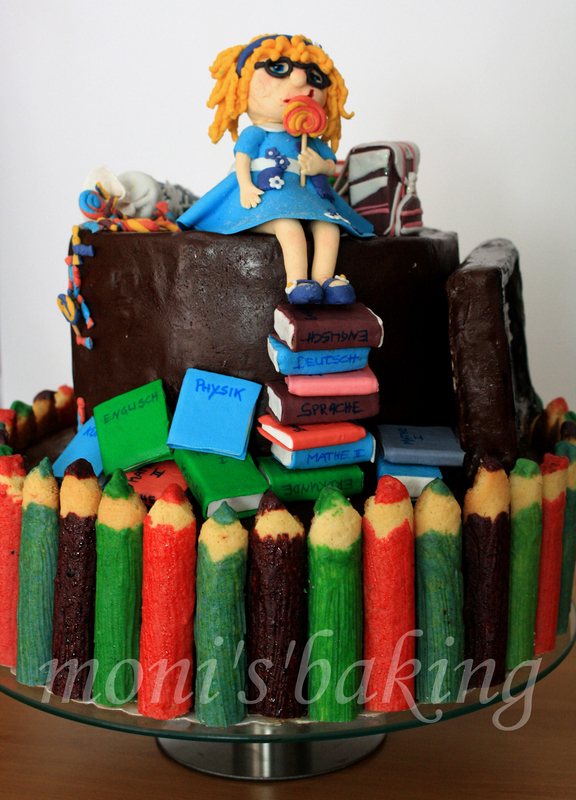 And this leads us to the second reason, why I wanted this fondant: because I think that colorful things like the crayons, candy, and books look very nice and bright on a dark background. Don’t you agree? Anyhow, unfortunately the fondant came out very bumpy and did not meet my expectations here. All in all, decorating the cake was easy and fast, having all the decorations prepared and ready. I glued the crayons with edible glue, but secured them with melted chocolate afterwards. Everything else I glued to the cake with the glue. My niece and her parents were very happy and excited with the outcome, which is always the best thank you and payment for a baker. The cake was treated like a star and it seemed like it got the most pictures on that day. 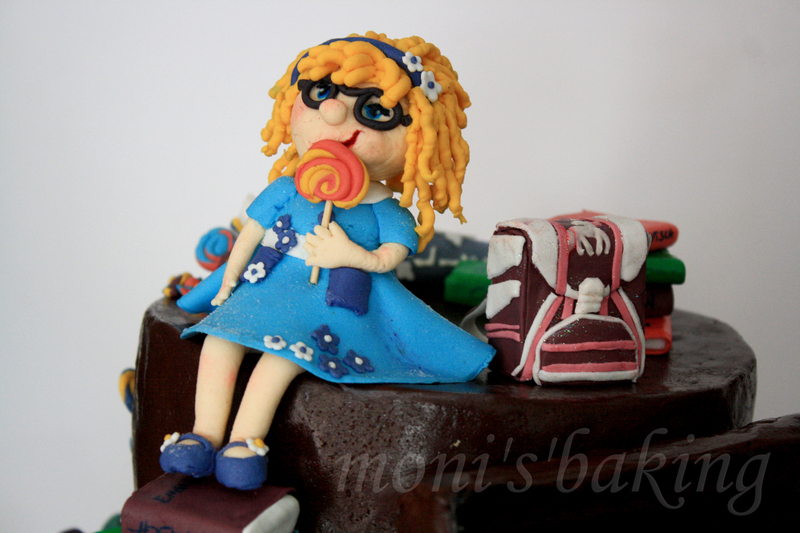 Your are not just the one honored to make it – you are the ONLY ONE of our entire family who can create cakes like this! Aaaww.. Thank you so much! But I know another very good team with great baking and decoration skills in our family.